Our parish priest, Margaret Preuss-Higham, can be contacted on 01305 873978 or margaret.preusshigham@gmail.com. to the Parish of St. Nicholas, Abbotsbury. Please join us in any of our services and make yourself known to us especially if you have just moved into this community. 1st Sunday Parish Holy Communion, Common Worship, at 11.00am. 2nd Sunday Holy Communion, Book of Common Prayer, at 9.00am. 3rd Sunday Evening Prayer, at 6.30pm. 4th Sunday Morning Praise, Common Worship, at 10.00am. 5th Sunday United Benefice Service at 11.00am which takes place in any of the parishes of the Benefice of Abbotsbury, Portesham or Langton Herring. The calendar of events on this website or A Church Near You www will give you the up to date details. On Wednesday morning at 9.00am we say Morning Prayer together. Little of the ruined Benedictine Abbey of St Peter remains. Foundations of the north wall can be seen in the churchyard on the right as you walk past the west door towards the disabled access of the churchyard. More can be seen as you walk towards the Tithe Barn. A plan of the most likely layout of the Abbey of St Peter can be found in the back of the Church over the bookshelf. A time switch operates the lighting of it. Outside the north door against the churchyard wall are two medieval sarcophagi from the Abbey of St Peter. There are over 60 kneelers inside the Church executed by ladies and gentlemen of the parishes in 2001 depicting all aspects of community life. They have their origin from the village millennium banner project, three banners made by St Nicholas ladies can be seen in the church. 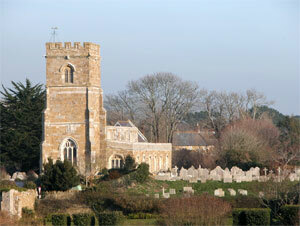 Over the last few years the churchyard has been part of the Living Churchyard Project of the Dorset Wildlife Trust. There is a woodland area and close mown and less formal wildlife areas. A dedicated group of volunteers look after the churchyard and the managed grass cutting scheme helps to maintain the ancient seed bank. Recently compost bins have been made by one of the volunteers and bird boxes have been set up. The 2000 Millennium yew can be seen near the war memorial. Why not spend a few moments quietly on the seat given in memory of another faithful member of the congregation, Gordon Hanson. The worship of God has taken place on or near this spot for more than one thousand years. It is rendered here still. Will you pause and offer a prayer to God for the success of his work in this parish. St Nicholas was built as the Parish Church of Abbotsbury, along side the Abbey Church of St Peter, in the late 14th or early 15th century. The oldest parts of the building are the tower and the north wall. Early in the 16th century the double arcade was built and the south aisle was added. It is probable that the main window behind the reredos, the outline of which can be seen from the churchyard, was blocked at this time. The flat ceiling of the nave dates from the early 19th century when the west gallery and a north gallery were built. The north gallery was removed in 1885 but the entrance is still visible outside the north wall. The Tower contains six bells, dating from 1636 to 1773; the bells were rehung in 1897. The panelled arch of the tower is characteristic of 15th century West Country architecture. The Porch is part of the original building and it contains an effigy, in Purbeck marble, of one of the early abbots. The effigy was found on the site of the Abbey Church of St Peter in 1778 and is probably late 12th century. The Reredos which covers the whole east end of the Church above the alter, was inserted in 1751 by Mrs Susannah Strangways Horner. It is of stucco, flanked by Corinthian pillars with an ornamental canopy, and displays the Ten Commandments. It is regarded as a very fine specimen of ecclesiastical ornament, few examples of which remain in country churches. It has been restored and regilded. The barrel-vault ornamental plaster ceiling of the chancel was installed by Sir John Strangways in 1638. The lower panels display the armorial bearings of the Strangways family whilst the central panels are of angels and cherubs. This ceiling was restored in 1986. The Organ was built by JW Walker & Sons and was dedicated on the 29th September 1886. The Wooden Pulpit is probably Jacobean, but could be Tudor. Two musket ball holes can be seen in the back of the canopy. These occurred in September 1664 when Parliamentary forces expelled a Royalist outpost from the Church. The Royal Arms on the west gallery are Georgian and were probably installed in the early 18th century. The Brass Chandelier hanging in the nave, and the two smaller ones now over the chancel, are mid 18th century and were probably the gift of Mrs Strangways Horner. The octagonal font is thought to be original, although the base is modern. The north gallery was removed during extensive alterations in 1885. At this time the barrel organ in the west gallery was removed, the pulpit was moved closer to the chancel and the old box pews replaced. At this time too the porch floor was lowered and the Church paved with tiles, the font was also repositioned. In 1996 the Church was again re-ordered in memory of a faithful member of the congregation, Admiral Sir John Hamilton. The alter was brought forward, the choir stalls were taken out thus opening up the chancel, the font was moved to the north door and some pews moved to facilitate access to a Church building which is used for community purposes such as concerts as well as for worship. Very little ancient stained glass remains but fragments are to seen in several windows. The memorial windows to the right of the alter were installed in 1910 in memory of the 5th Earl of Ilchester and two of his children. They were designed by Anning Bell RA, an artist whose work appears in the House of Commons and many cathedrals. Three windows are memorials to members of the Sellers family. Among the various memorial tablets there is a brass in memory of Captain Benbow, the son of a former head gardener at Abbotsbury, killed at the end of the Great War in the newly formed RAF. A tablet also records, with thanks to God, that no men or women from Abbotsbury were killed during the 1939 – 1945 war. On the west face of the tower is an ancient stone carving. This may date from the founding of the Abbey by Orc in the 11th century. It is of a seated figure with a smaller figure between its knees, and a dove in the right hand top corner, and is symbolic of the Holy Trinity.